Welcome to the FAQ's page at The Football Trade Directory, if you can't find the answer your looking for don't hesitate to Contact Us. Q - How do I register my football club or company? A - It is a good idea to first use the search facility on our homepage to double check whether your club or business is already registered. If your club or company is registered you can become a member of their group (see 'How do I become a member?' below). Access and registration for clubs is FREE at all times. Companies receive our Free membership FOC which includes a basic two line entry. For a more interactive advert, and access to our wide range of services and databases, take a look at our media pack here for more info. Q - How do I change my club details? A - Once your registration has been approved you can log in using your Username and Password you received by e-mail when you registered. Simply click on the 'Sign-in' button on the home page, log in and you can then make amendments to your club/company details. Q - I’ve lost my password, how can I get a new one? A - If you have forgotten your password, we can send you a new one. Simply email us at office@footballtradedirectory.com. Once you receive your new password you can log in and change it to one you can remember easily. Q - Can I register as an individual? A - Yes, individuals who do not belong to a club or company can still register for the site. Simply click the 'Register for Free Newsletter' below. Q - How do you use my details? A - We are fully conversant with data protection, and your details will not be passed to any third parties without consent. Q - How often is the newsletter published? A - The newsletter covers the latest grassroots and commercial new and is published weekly and emailed to all registered individuals. For more information and to view and download previous newsletters check out the Newsletter page. Q - How do I supply editorial for the newsletter? A - We will accept stories from clubs and our members. Ideally stories should be between 400 and 500 words, and have two or three images supplied. We reserve the right to edit any content. 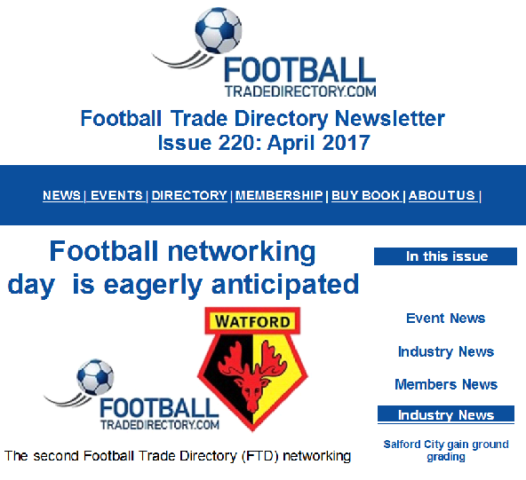 Stories can be emailed at any time to office@footballtradedirectory.com and they will be published as soon as possible. Q - Is there a charge for the newsletter? A - No, the newsletter is free to all registered individuals provided we have a valid e-mail address. Q - Why are club registrations FREE? A - The whole ethos of the site is that it provides a service for football clubs from the top of the pyramid to grass roots. There is no charge for accessing the site for registered club officials, players or supporters. Q - How much is it to advertise on the website? A - By joining FTD you will become a member of a vibrant commercial community and the range of our client base typifies the fact that we have such a wide appeal in the market place across all areas of football business. We are flexible and will prepare tailor made solutions for your business. For more info take a look at our media pack here. Q - How much is it to advertise in the printed version of the directory? A - The printed version of the directory is distributed FOC once a year into football clubs from the Premier League to Grass Roots. You can advertise from as little as £250 for a quarter page. Take a look at our media pack for the paper directory rate card on page 4. Q - Why do you have a Free membership? A - As stated above, the ethos of the site has always been to offer clubs a service. Free membership ensures that there are a sufficient number of registered companies to make the site of use. Q - How many categories can I register my business in? A - Free members can register in 1 category. If you have a members, you can enter your business details in up to six categories. Q - What do advertisers get for their money? A - The benefits of advertising with us are outlined in our media pack. In general terms you are joining the fastest growing commercial football community, which enables you to put your business in front of 100,000's of potential customers. Q - Who owns foot­ball­tra­dedi­rec­tory.­com? A - The website is owned by Sportsglobal (UK) Ltd, registered company no 6790604. Q - How do I contact foot­ball­tra­dedi­rec­tory.­com? A - You can find our contact details here. Q - Where is foot­ball­tra­dedi­rec­tory.­com based?